The children have been reflecting on their writing development. Individually, they looked through their writing books, comparing their writing at the beginning of the year and their writing now. Then they worked with their writing partner, looking together at each other’s writing, noticing how the writing had improved. 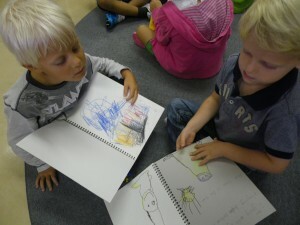 Finally, we met as a whole group and the children shared their observations. The illustrations have more details. Before there was no text. Now we can write letters. We can stretch the words to hear the sounds. We can write with lower case letters. Now we know about speech bubbles. We don’t need a teacher to help us. We can do full stops and sentences. We leave spaces so (the writing) is easier to read. We know tricky words with silent letters. We made a VoiceThread and the children reflected on their personal writing goals. This is a work in progress. I have been adding my reflections to the children’s. It would be lovely if parents, siblings and other family members and friends could add their reflections also. Getting and giving feedback on writing is an important part of the writing process. The children love to take turns at reading stories to the rest of the class. This is a wonderful opportunity to develop a sense of audience and to practice skills such as pause, voice pace and inflection. Recently, Olivia read a book that she had particularly enjoyed. We videoed the story session and showed the video to the children. I was keen to try out a new reflection tool that I had learned from Mr Geddes which involved speeding up a video clip. I tested this new technique on the clip of Olivia’s story time The children loved the speeded-up version and asked for both videos to be posted on the blog. As part of our unit of inquiry into where we are in place and time, throughout the year the children will be reflecting on their personal learning journeys and on how their growth and development leads to new opportunities. The children have been thinking about things they can do now that they couldn’t do before. They recorded their thoughts on the VoiceThread below. plan and work as a group, communicating with team members to assign jobs and roles, and to ensure that all the parts come together to create the final masterpiece. The movie is nearly finished. Have look at our photopeach to see some of the process. You can find out about the process in more detail by scrolling down to the bottom of the Unit of Inquiry page (see tabs at the top of this page) to the section entitled KC Movie Makers. A couple of days ago, the children noticed that one of our goldfish, Sandy was bent double and was lying on the bottom of the fish tank. Lego, the other goldfish was also looking a bit sick. We observed the fish carefully for the next two days. Lego seemed to get little better. However, Sandy was bent double and was not moving. But the children noticed that he was still breathing. We did some internet research and found out that Sandy had bacteria in his stomach which was making him bend in the middle. We found out that there was no way to help Sandy because the bacteria was already in his stomach, and that Sandy was going to die. We talked about what we should do about Sandy. After much discussion, the children decided to take Sandy out of the fish tank so that he would die quickly, and so that he wouldn’t infect the other fish. The children wondered where to bury Sandy. They remembered burying Madeline and were able to transfer knowledge and understanding from that experience. Where can we bury Sandy? We can’t bury him with Madeline because the children planted seeds and we might dig up the seeds. Yeah, because now it’s a garden with things growing. Before it was nothing growing. So maybe we can put him in another garden? But we don’t have another garden. How about if we went to the park to bury it? Yes. I agree with Jenny’s idea. No, we can’t bury in homes. I think he don’t understand. It’s because we buyed the fish at Homes, that’s why he think that. Yeah, he’s good at remembering. No space in the park. We can’t put in the desert because it’s too far away and there might be sandstorms. Anyway there are no deserts in Japan. It’s too far away. We have to go in a airplane but we can’t do that. I have an idea. Maybe we can bury the Sandy outside of the school? We can put it in a zip bag and we can bury him. No, we can go on the train. Nihon Odori. It’s the next stop. Yes, it’s only one stop. But not in the ocean. Or we can bury him in Yamashita Koen? The discussion bounced from child to child with very little adult intervention. It is interesting to see how much the children’s speaking and listening skills have developed since the beginning of the year. The children are listening to each other and are building on and developing each other’s ideas; every child contributed; all of the contributions are relevant and logical; the children are supportive of each other and everyone’s ideas are respected. Uh oh! Carl just noticed that now Lego is bending in the middle. Today KC and KF joined together to play a game to help them learn about 3D shapes. Jenny and Aina showed the rest of the children how to play. Jenny and Aina sat back to back, so that they could not see each other. Aina went first. She chose a shape. She did not tell Jenny what shape she had chosen. Instead, she gave Jenny a clue. Jenny asked questions to help her find out what 3D shape Aina had chosen. Jenny: Does it have 2 faces? Jenny: It it a cone? Jenny: At first I thought it was a cylinder because it has a circle and it rolls. And that could be a cylinder. But a cylinder has two faces. So it has to be a cone. Then it was Jenny’s turn to choose a shape. Jenny started with a clue and then Aina asked Jenny questions about the shape. Aina: I need some more information. Jenny: It doesn’t have any edges. Aina: Is it a sphere? Aina: The best clue was it had no corners. Then all the other children worked with a partner from the other class, and had a go and giving clues and guessing each other’s’ shapes. The children had to think carefully about the number of faces, edges and vertexes the shapes had. Many children were able to identify several different kinds of trapeziums and pyramids as well as more simple 3D shapes.